"Great series of videos. Only one small mistake." "Part 2: 5:15 Voorhis mistake of thinking banks lend out 900% of the deposit in new money when it's 90% over and over again up to 900%. The error is thinking he collected $45 and paid out $3 to the first depositor but he actually paid out $3 to each of the other depositors totalling $30, not $3. But that's a minor erorr that does not detract from being ritght on everything﻿ else." 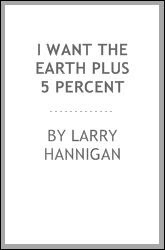 Here are the links to the 5 parts of this video "I Want The Earth Plus 5 Percent"